Join the movement and Kick Plastic with us! This fall we are entering our third phase of the #KickPlastic Campaign pioneered by Costa del Mar. Casa Vieja Lodge will become a plastic-free campus by eliminating all single-use plastic bottles both at the lodge, and aboard our 10-boat fleet. All anglers will receive a YETI 18oz Rambler Bottle upon arrival at Casa Vieja Lodge, their lifeline to water consumption. 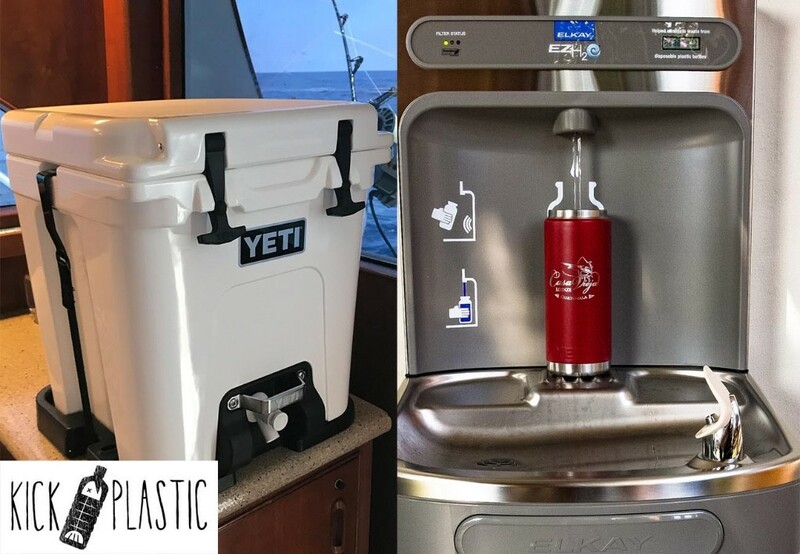 Three Elkay Water Fountain and Bottle Filling Stations were installed at the lodge, where clients can refill their YETI Ramblers during their stay. This water goes through a 4-stage filtration system, including a UV purification process and the solution to pure, clean drinking water at Casa Vieja Lodge. “The largest consumption of single-use plastic water bottles is on our fleet. We average about 6 bottles a day/person. That equates to 60,000 a season just on the boats, add the consumption at the lodge and we are at 80,000 plastic bottles. That’s just wrong for the environment we rely so heavily on.” said Captain David Salazar. If we can kick plastic in Guatemala then there’s no reason why you can’t do it in your own backyard. Join us to build a better world for tomorrow- one plastic bottle at a time! We need anglers to go catching. What are you waiting for? Make the call. Take the trip. Check it off your bucket list! Calling all anglers, pros and amateurs, are you ready to experiece the best billfishing in the world? If your answer is No, then sorry who are you? If your answer is YES, then look no further, book your flight, and come down to beautiful Casa Vieja Lodge. Our Captains and Mates are ready and willing to teach you all of the secrets so when you are home, fishing with your buddies, you can show off your new skills! Our crews are the best in the business and want to teach you whatever you want to learn out on the water. Fishing at Casa Vieja Lodge is a customized experience for every angler. 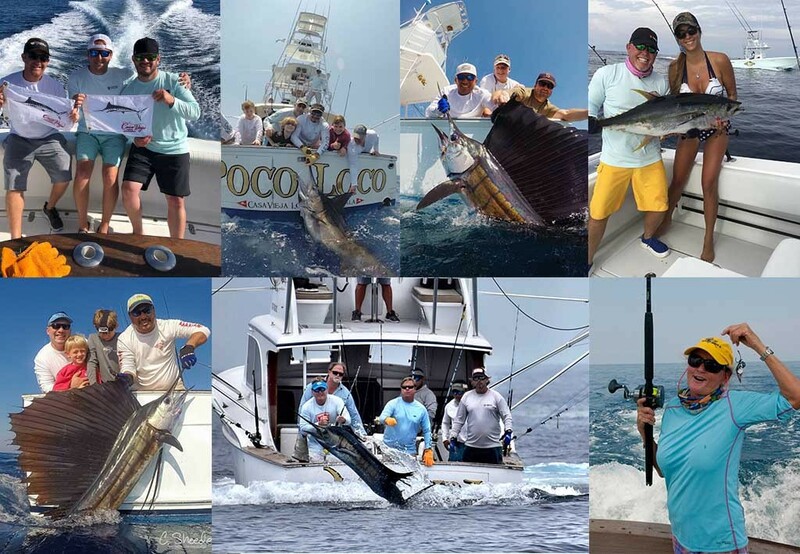 Our goal is not to get high numbers, it’s to make the best experience possible for YOU, our awesome anglers. As you know, January-March fill up about a year in advance. We still have limited availability in April, May, & June. 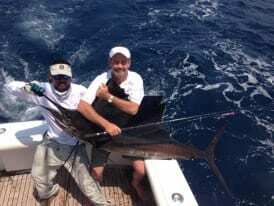 If you follow our daily fishing reports from this past season, then you know how AMAZING the fishing is from April-July, not to mention the flat calm seas and heightened blue marlin bite! Call now to reserve your spot! What better way to wine & dine a new client, hold your annual meeting, or show appreciation to your employees than a get-away corporate retreat. At Casa Vieja we cater to groups of all sizes, small and large. We take pride in the relationships that are grown and strengthened on the water and after a long day of intense fishing! Team bonding is a given when coming to Casa Vieja Lodge. Impress a new client and make them think you did all of the planning, when really, you can leave it to us! As easy as it is coming with a small group of friends, its truly effortless with a large group. You simply reward those workaholics with an invite to Casa Vieja Lodge, and we’ll introduce them to the 5-Star Angling Experience and spoil them for life! PreviousPrevious post:Shhh… Don’t tell Everyone about Casa Vieja Lodge!NextNext post:Work Hard, Play Hard, Fish Harder! Your lodge, staff, boats, captains and mates were second to none. When you surround yourself with great people like Antonio, Capt. Chris Sheeder, Marijo, Freddie, Juan Carlos and Jake, good things are going to happen. I know the amount of training and the vision required to run a successful operation – and apparently so do you! I’ve fly fished in a lot of different places over the years, I can honestly say that I’ve never had a better overall experience at any other lodge. 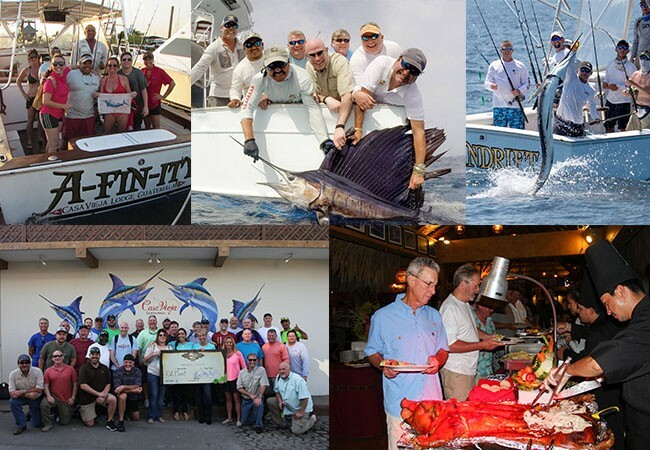 between the incredible fishing, excellent captains and crews and superlative staff–it is one of the “must do” experiences for anyone who loves fishing. Robert “Danny” Cline, Jr., Esq. The Casa Vieja Lodge is no ordinary lodge…..its a 5 Star Lodge with impeccable attention to detail and customer service. The staff goes out of their way to meet your every need or request and they deliver the highest level of customer service possible.